You are here:Home Vocal Technique How can I teach style without hurting the singer’s voice? It is extremely important to realize that teaching style is very different from teaching technique. Many teachers specialize in teaching a particular genre or style, such as musical theater, classical, or pop. But a student needs a foundation of good technique before they get too far into any particular style elements. Achieving balance in every voice and committing that balance to muscle memory is our first priority—style comes later. When students start working on songs, we consider what style they are singing and what types of nuances and elements to incorporate in addition to what they’ve already learned. But it’s important to realize that adding style may pull a singer away from good technique. How far it strays from good technique and vocal health depends greatly on what the style element is that they are trying to characterize. R&B styling, such as riffing, is something that actually requires very good technique because a singer will need to be able to move around fluidly in their voice through various registers to do it. Another way of stylizing is using an airy quality in the beginning or at the end of a song. This is okay as a once-in-a-while choice, so long as the singer is not singing airily all the time. Classical singing might encourage a very light feel throughout the voice, or a very light feel in the bottom, or a feeling of no bottom in the voice at all. Singers learning a classical style must be taught how to have a strong tone and chest voice, yet not be overpowering in the bottom. Rock and pop singing styles typically might invite more strong press and heaviness in the voice. We must encourage the singer to sing strong but know how to mix—not yell—into the high notes. 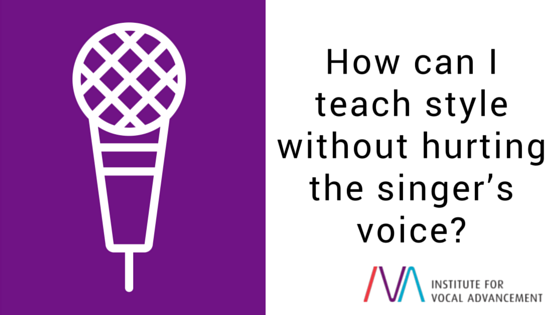 Some students will even ask, “Can you teach me how to scream?” or, “How do I get a husky, raspy sound?” These types of style elements can actually be very damaging to the voice. With these types of requests, you might either discourage it entirely or, if they are sometimes using a raspy sound, get the student to use it as sparingly as possible. Always balance the voice first with technique, getting the student to become very familiar with what good technique feels like. Then, once they’re working on a song, try to strike a balance between technique and style so that they don’t stray so far from good technique that they can’t get back to it. If their technique is strong and in their muscle memory, your students will know how to come back to that and still incorporate various styles in a healthy way that won’t damage their voices.